While there are several reasons for sore gums in children, such as having a tooth coming in, the pain is often an early sign of gum disease. Nearly all children have gingivitis, according to the American Academy of Periodontology. However, you can reverse gingivitis in its early stages before it becomes periodontitis. Bleeding of the gums during brushing is usually the first sign of gingivitis. It's not normal for gums to bleed during brushing. Other symptoms include swelling, puffiness and redness of the gums. The gums can become tender to the touch and discomfort can occur if your child eats something that irritates the gum line. Gingivitis can progress to gum disease, causing even more discomfort as the gums recede and pull away from the teeth. If your child is unable to brush his teeth after eating sugary and starchy foods high, he is at risk for developing gingivitis. Plaque creates a sticky layer of bacteria that irritates the gums. If the plaque is not brushed off, it can harden into tartar, which builds at the gum line and causes the gums to pull away from the teeth. Pockets develop in the base of the tooth, which allows bacteria to attack your child's superficial gum tissue and possibly the jaw bone. The bacteria that cause gum disease can be passed through saliva, so gingivitis is common among family members. Teeth grinding increases your child's risk of gum disease. Gingivitis in its early stages can be treated by improving your child's oral hygiene. 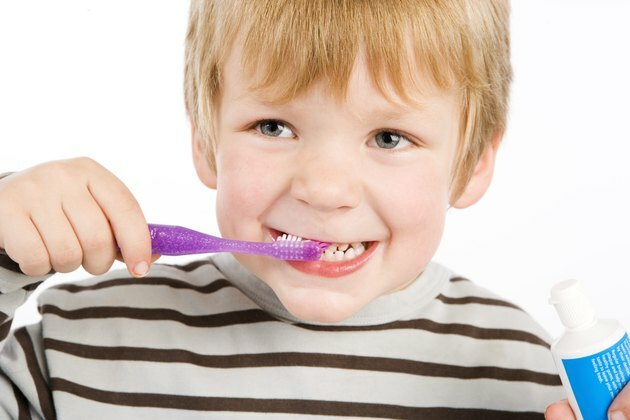 Have your child brush his teeth twice per day with a soft-bristled toothbrush and toothpaste containing fluoride. Flossing removes food debris from between the teeth. Make a dentist appointment as soon as your child's gum soreness is present so a thorough cleaning can be done. If gingivitis has advanced to periodontitis , a deep cleaning is often needed. A mouth rinse containing antibiotics is sometimes used to control bacteria of the mouth. Ask your dentist if a rinse is appropriate for your child. Regular brushing and flossing as well as twice yearly dental visits will reduce your child's risk of developing gingivitis. If your child grinds his teeth, talk with your dentist about whether a night bite guard is appropriate. Replace foods and beverages that are high in sugar with healthier alternatives. If your child just has a tooth erupting, he may pull on his ears, put his fingers in his mouth and lose interest in eating. The gums toward the back of his jaw may be red. The tooth can often be seen pushing against the gums. of the inflammation teething causes at the gum line. Acetaminophen or ibuprofen may provide relief for teething and the accompanying inflammation at the gum line. Always consult your physician about appropriate medications and dosages. Can Milk Cause Black Gums in Children?